This spectacular costume was made by the Trinidad and Tobago Social Club for Boston's 34th annual Caribbean Carnival in 2007. Like West Indian Carnival festivals in other cities, this pre-Lenten celebration is connected to Mardi Gras. Once a club chooses a decorative theme - in this case, Caribbean Cocktail, designers fabricate and fit costumes, sometimes weighing over 200 pounds, to an individual dancer. Weeks of welding, sewing, and gluing are an investment of creativity, energy, and patience that pays off in spectacular costumes. Many in the Caribbean cultural community live for carnival. 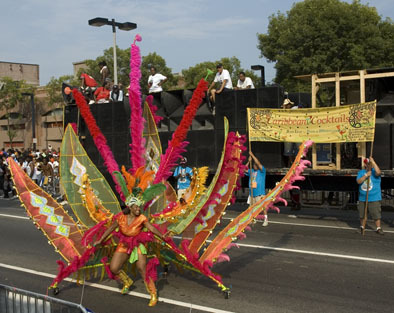 The Trinidad and Tobago Social Club (T&T), headed by bandleader Errol A. Phillip, is one of nine Boston-area bands (name for masquerading group) that consistently win top prizes in carnival competitions. Prizes are awarded based on overall presentation, costume design, and theme. Here, bandmember Ventrice Shillingford wears the costume, as she performs for judges at the final stop on the parade route.